So Crufts is over for another year and this year was a little different to previous years. As our followers will know from our previous blogs, I was selected to represent the Good Citizen Dog Scheme in the Silver Display Team! After 6 weeks of practice with our team mates, the day came to travel from Somerset to Birmingham for two days of displays, fun and a little bit of all important shopping thrown in! The Hoomans decided to stay at the Travelodge in Perry Barr for two nights to make sure we were at the NEC in plenty of time for our first and last rehearsal on the famous green carpet. We had been allocated a practice time of 7am so being late was not an option! The people at the Travelodge were super friendly and unlike many other hotel chains, I was welcomed into the hotel and allowed to sleep in the room with the hoomans. Thursday morning arrived with an alarm going off at 4.30am, two humans to shower and get ready and leave the hotel to drive the 30 mins to the NEC. We arrived at 6am on the dot, parked and had a chilly walk of around 20mins to Hall 3 which gave us 20 mins to get settled and set up on our bench before preparing for our practice. Our first display was at 9.30am and I think the whole team were a little nervous. We all had our matching blue and silver collars and leads and our trainer had given us a lovely gift of matching blue bandanas for us to wear with their names on. When the music started we were off! All our practice had paid off, our lines were straight, everyone was in time with each other (and the music) and all the dogs were super well behaved. The display continued being awesome with each section going exactly as planned and finally the group recall went without a hitch! Our closing heelwork sequence was as great as the first too. 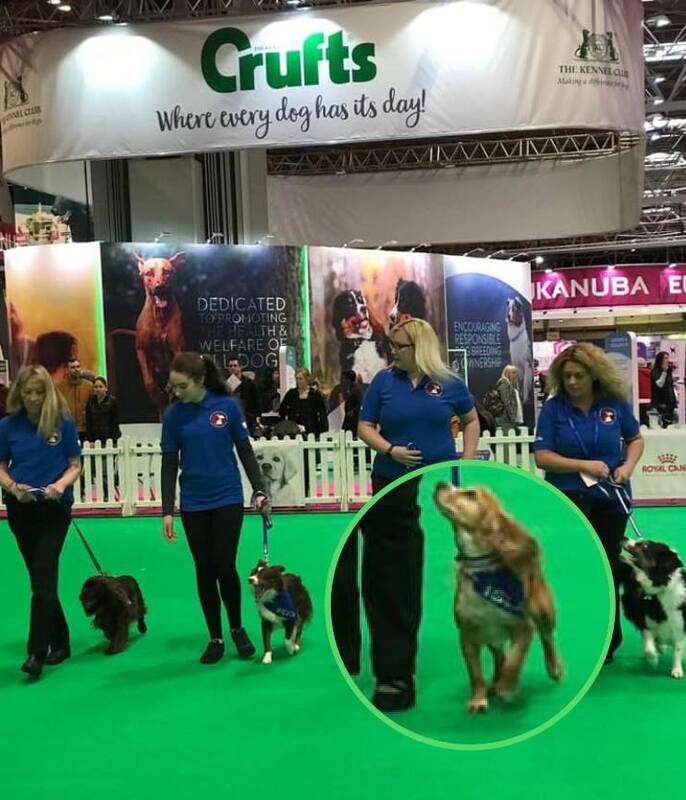 Everyone was in time, the dogs were all walking really nicely on their leads and showing the crowd exactly what the silver section of the award scheme takes. After our display was over we had a great group photo taken on the giant Crufts sign! This was hilarious to try and pose for, as all 9 of us dogs were all sitting or standing on various letters of the sign! We had some individual pictures taken too as a little memento of the occasion. The hoomans watching us clapped and found the sight very funny and impressive! We had a three hour gap between our first and second display. Perfect timing to have a relax on our benches away from the hustle and bustle of the show. Over Show numbers people attend Crufts so it’s VERY easy for little paws to get trodden on. This is one reason why only dogs competing or involved in displays can attend and why they have their own entry and exit points from the venue. The second display was as fantastic as the first and not one of the dogs or handlers let the team down. Another 3 hours in between displays was the perfect opportunity for some lunch and a sleep and gave the chance for the owners to do a little shopping! There were over 500 stands selling everything from coats & collars to toys & treats! Most stands had very good show offers too so plenty of pennies could be saved when buying your pooch something nice! Lots of our friends were at the show selling some lovely products too. Knit my Gift had their lovely doggie blankets which can be personalised (I had mine to cover my crate on the bench), our FAVOURITE friends at George Barclay had their gorgeous yet practical beds for sale. We were very excited to see that they had chosen a rather adorable photo of Jelli to use on their stand as well! As we were wandering around – we saw that the Good Citizen Marketing Team had also used a photo of Jelli and I on their wall of fame! 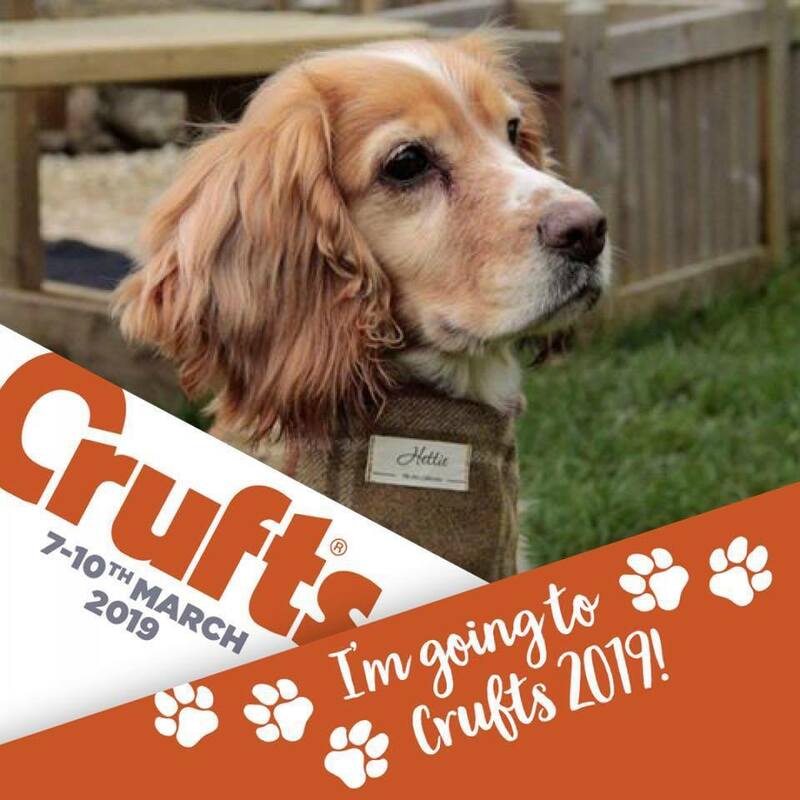 We were a bit sad that both Guru and TransK9 weren’t at Crufts, as I’m always keen for cuddles from Lisa & Sam from Guru and Robert & Sharon from TransK9 but will catch up with them at DogFest and other events this year! After our final display of the day was over we all partook in a group down stay! This involved all the dogs from the Puppy, Bronze, Silver AND Gold display teams! Over 40 dogs entered the ring and carried out this exercise brilliantly! Once this was over it was time to pack up our bits and pieces and head back to the hotel for dinner and a good nights sleep! We had a slightly later start on the Friday morning so made it to the NEC for around 8am. We had much longer between our first and second display AND we had a lovely visit from the hoomans parents (my grandpawrents!) They stayed all day to watch our displays and watch some of the boxers being judged in the breed ring! Bella the boxer has some serious work to do if she wants to get to have her moment at the Worlds Greatest Dog Show! We used the time to have lots of rest and cuddles and have some photos taken at various different stands including Zoflora and Jeep! Whilst my Hooman mum stayed with my on my bench looking after me, my daddy Hooman went to watch some Agility in the main arena! 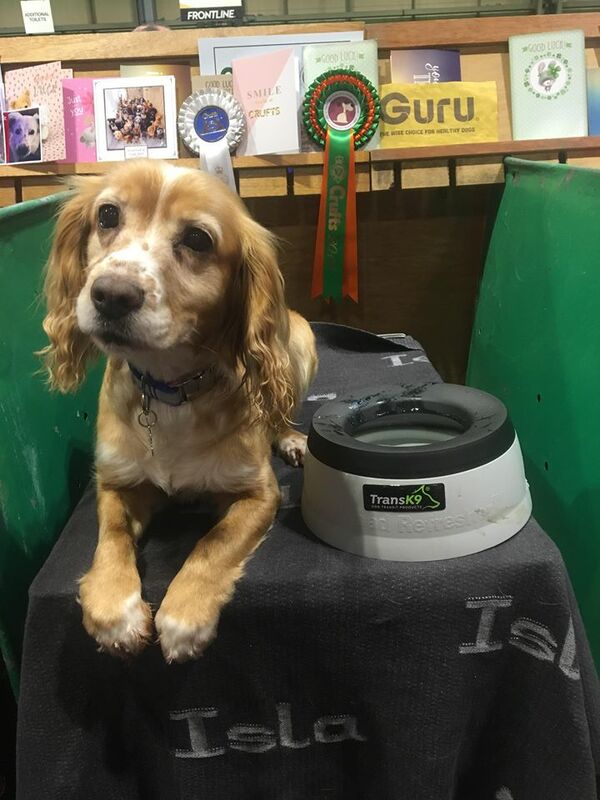 He was very impressed with the high standard of all the dogs competing and is now offering more encouragement to Jelli as she continues her agility career! . Finally we started and finished our third and final display and again did the group down stay. We have had SO much fun since January making new friends, polishing off our sequences & routines and most importantly showing the importance of responsible dog ownership to the public! We cannot wait for next year now! We would love the opportunity to be selected again or maybe even be selected for the Gold Team! I am doing my Gold test soon so who knows!